Discussion in 'Faucet Script & Addon' started by tungaqhd, Mar 27, 2018.
hello admin, thanks to build something like this. i have to using your faucet script. my question is how to add more shortlink api in coinbox.php, in there writing code $link_default and above of that writing $link and other. Why always $link_default is using for my visitor and other link is not using. Please how to make all link work at random for every visitor? I´m just getting you were locked for 5 minutes errors, help me please. Any idea what i did wrong? Tell me if you need further information. Thanks! Same problem for me, 5 minutes locked for "multiple claim". can i run all my faucets on a single database ? also is there any patch for the v2 timer ? "Error connecting to Please login or register to view links. Either your hosting provider doesn't support external connections or FaucetBOX.com API is down. 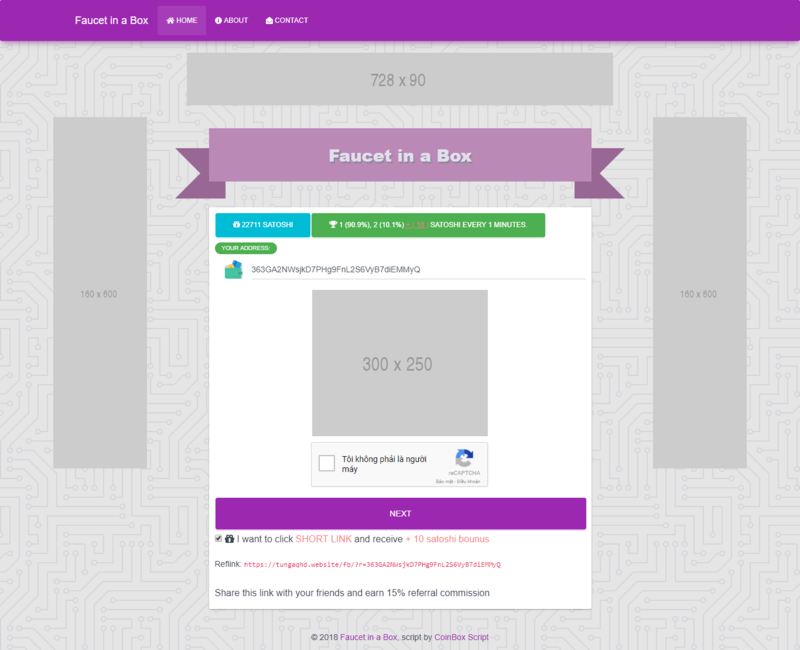 Send an email to support@faucetbox.com if you need help." emank bisa gan dipasang di wordpress ? were i wiill put my shrtin links?? Open Please login or register to view links and fill other information. amazing script, ty a lot. but how can i change backgound color (gray) and bar color (purple)? i edited style.css, but nothing chaged.